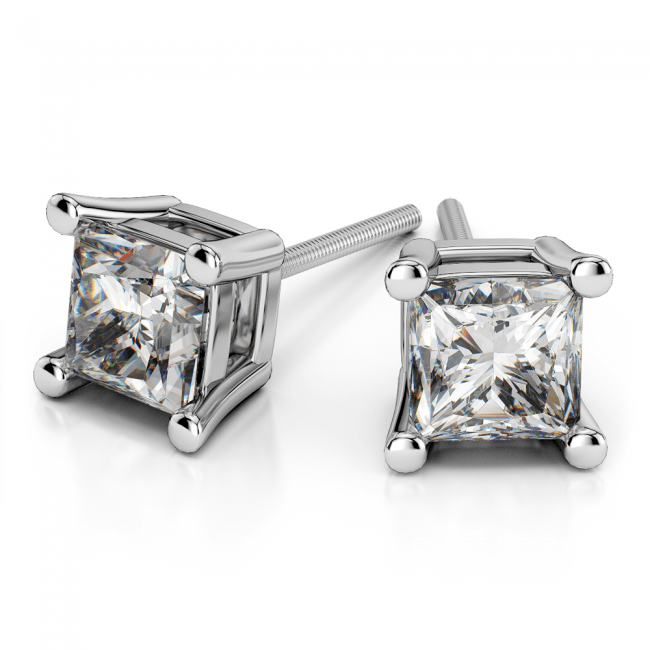 Are you planning on purchasing princess cut diamond earrings? One of the many decisions you’ll have to make is what size you want the diamond earrings to be. This may seem like an easy decision, but it can be overwhelming if you start the search unprepared. To figure out what carat you should choose, try answering the following questions. 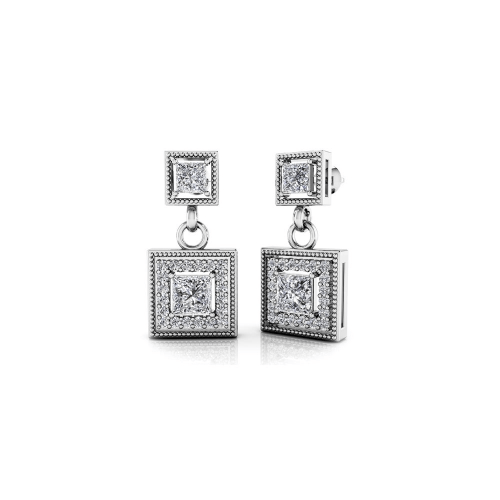 Where will you wear the princess cut diamond earrings? The first step to determine what carat princess cut diamond earrings you should purchase is to figure out where you want to wear them. Will these be your new everyday earrings? Or are you planning on saving them for special occasions? Stud earrings under one carat each is a great size for everyday wear, while princess cut diamond earrings over one carat are probably too flashy and large to be worn on a daily basis. If you’re looking for earrings that you can reserve for special occasions only, go for a larger carat weight in a fancier setting, like a drop earring or a halo stud with small, pave diamonds around the center princess cut stone. What other jewelry will you wear? This is an important question to consider when choosing what carat princess cut diamond earrings to purchase. Do you plan on wearing other jewelry pieces with the outfit, and if so which ones? If you want to wear a necklace along with the princess cut diamond earrings, stick with a smaller carat such as this one-half carat diamond stud. This will complement the rest of your jewelry without overpowering it. However, if you plan on wearing the earrings with no other jewelry, you can choose a larger carat. Try a two carat diamond stud, which will stand out and make a statement when it’s not competing with other jewelry pieces. How big are your earlobes? One way to determine what carat princess cut diamond earrings you should purchase is by looking at your earlobes. When a diamond is too large for your earlobes, its weight will pull down the lobe, possibly causing pain and definitely causing discomfort. The diamond will also tilt toward the ground, meaning that people won’t be able to see its beautiful sparkle. Feel your earlobes to determine how thick they are, and choose a smaller carat size if your lobes feel thin and delicate. When deciding what size earrings to purchase, it’s important to think of how different sizes will look with your hairstyle. Do you have a short, pixie cut or bob? These styles look better with smaller, understated princess cut diamond earrings. If you have long, flowing hair, smaller diamonds may get lost behind all that volume. Instead, choose a larger carat size that will be able to stand out even when you wear your hair down. Many ladies who live a busy, on-the-go lifestyle prefer smaller princess cut diamond earrings, such as a three-quarter carat total weight diamond stud pair. These women don’t want to worry about losing an earring, snagging it on their hair or clothes, or looking too flashy as they go about their day. However, if you live a more settled life or frequently have to rush from work to business dinners with clients, you may want to choose a larger size, like a three carat total weight diamond studs. No matter what size you choose, be sure that it speaks to your personality and style. After all, as long as it makes you happy, it’s definitely the right size!